Thinking of putting wooden floors in the salon. With the inside heat in the summer and cold in winter what brand would you suggest. Floating or glued? Pretty traditional to have wood floors in a yacht. It's only money that has attacked that tradition, though there may be folks who actually like vinyl, plastic or carpet flooring. Unvarnished Teak with raised Holly strips was the old European fishing boat interior flooring; you could clump around in your wet boots and not slip so readily. Plenty of older boats happily made do with laid plank decks. Yachties took a liking to the Teak, but with flush Holly strips, and varnish. It's such a beloved classic look that there are plenty of veneered plywood and plastic products made to emulate that look. There are technical and maintenance issues to be handled. Sure, it's your boat's interior but there's plenty of sunlight and tracked-in water, let alone galley spills, leaks from ports, etc., to make warping and finishes a tougher problem than in your home. Depending upon your boat's layout, some of this floor will be over the engine room, so noise and heat, as well as drying are to be handled as well. Some of this flooring will be over bilges which may well be damp. Now some specifics (retired classical architect here...): Your structural floor is probably plywood; presuming you can get it clean and smooth (from old glue, etc., adding wood flooring should be no problem. It would add weight, thermal and sound insulation, and may well meet your taste. 1, No need, and probably no desire, for a residential-type T&G wood strip flooring, but nothing technically wrong with it, either. The separate strips will handle expansion and contraction and an exterior urethane finish would do. 3, A plywood sheet flooring would work, and best, I think, if glued. Joints would have to be considered for looks (often dropped into areas separated by the fiberglass structural grid in sailboats) and potential for chipping. The finish would have to be suitable for the use; you might get one refinishing out of it. 4, A plywood flooring product in small-ish pieces, usually with T&G edges would work. Typically, these are glued down, but many are intended to be 'floated' or adhered with double-stick tape. I think that either the floated or taped installations would be less suitable on a boat (I've seen this stuff buckled up in the middle of floors. I've seen this stuff where the individual 'planks' had cupped.) You'd have to be sure that these floors had an adequate finish for the marine service as the veneers are thin and there's no refinishing 'em. Many of these products have beveled or eased edges to protect the veneer edges; it's a look many folks don't mind. Many of these products are faced in smaller pieces of veneer to mask the 24" x 8" common size; it's a look that many folks don't mind. 5, A prefinished solid wood floor is another alternative. Typically, they are T&G, the same thickness or less than ordinary strip flooring, and have eased/beveled edges. I think many are finished top and bottom. Some may be sold with 'heavy duty' finishes, but the UV resistance would have to be assured. You can refinish 'em but I'd wonder about the appearance of the old finish at the eased/beveled edges. I like the solid Teak and Maple flooring, made up into 6" wide planks and screwed down to sole beams in our 44-year old Dutch-built sailboat. Original finish looks pretty good. 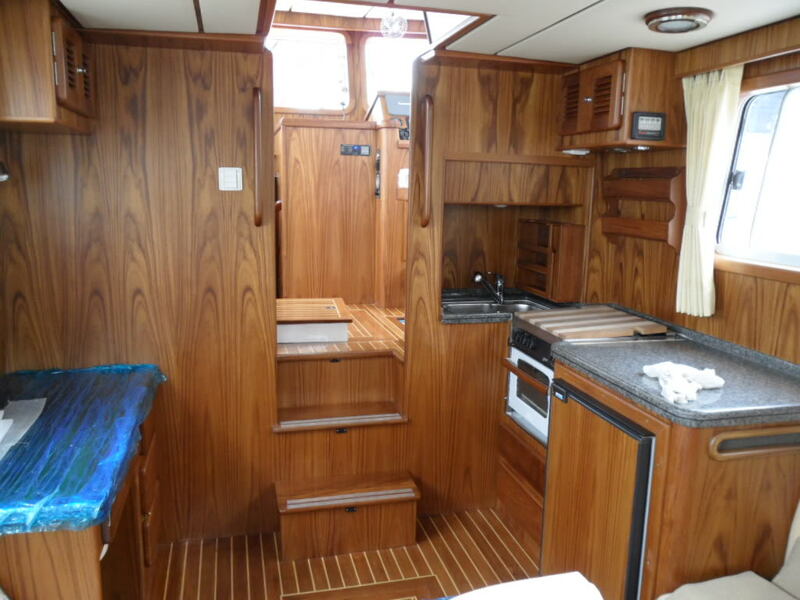 I like the solid Teak and Holly strip flooring glued down to Fir plywood in our '84 Taiwanese trawler. Original finish looks pretty good, some areas repaired by a PO. In our old girl we have teak parquet, the po had carpets, varnish and others sins applied to it... Last year we had the interior floors sanded and refinished with a swedish finish. You might think of sheet foam under your new floor to keep the floor warmer in the winter and help quiet the engines. I laid a cherry and white maple sole in my sailboat. I made it from 3" strips of cherry edge glued to 3/8" white maple and then glued into panels. 8 coats of epifanes two-part clear gave a nice durable finish. My powerboat has douglas fir t&g sole that is painted in the lower cabin and varnished in the upper cabin. Both are screwed to deck beams. Over the engine space I made removeable panels with 2" of soundown foam on the bottom side. A house wood flooring product will be slippery when wet. There are brands of sheet flooring that have no skid built in , Selene used to use it. Rather than sheet foam for underlayment maybe use sheet cork. We have wood floors in our boat but I don't know what type they are. You saw them kartracer. We have wood floors .. plywood. I paint them w Patio and Floor paint. Water based house paint. Extremely durable tested over years of back porch use in a house of the past. I was going to paint w marine paint but my neighbor that worked for Parker Paint brought me a gallon of Patio and Floor paint. Put on one coat green just like our boat now and it lasted years. Didn't use the front door so the porch was heavy traffic. Works just as well on boats. And the green goes nicely w the bright work. I have cork flooring in my bedroom at the house. My wife grew up with cork flooring and it's still in the house. Very durable, quiet, soft, warm. The only question is the substrate if it is a floating floor as in my house. I wouldn't use that type since it will disintegrate if/when it gets very wet. Maybe the Marinedeck product will work out better? My wooden floors are normally bulkhead-to-bulkhead carpet-covered. Thought you were going too nautical on us Mark but as I thought "Wall to Wall" .. That sounded really silly. Everybody loves wood but runs from a wood boat. I never say "wooden" as it sounds like "wooded toy" meaning cheap in the day. Before we added a holding tank between galley and head our floor was marine plywood covered with carpet. After the holding tank installation was finished we covered the sole,and access hatches with teak faced plywood .Six coats of Minwax hardwood floor poly was applied. I replaced "bulkhead-to-bulkhead" carpet with Amtico (a Mannington product) last winter. I opted for a teak-and-holly lookalike and am pleased with the result. It's tough, not slippery, impervious to water, and looks great. Amtico is a "luxury vinyl plank" product. We used a two-part epoxy to glue it down on top of a new 1/4 inch plywood subfloor. There's a thread on here somewhere about Amtico...search and you should find it. Nordic Tug, Aspen, and several other builders use it from the factory. I think FF might be right if the flooring was one of the melamine- or plastic-faced flooring products. However, typically, manufacturers would not wish to be sued for unduly slippery products. There are standards for slip resistance in the building codes. "Actually it's not slippery at all when wet... Plus when it does get water on it it doesn't turn white like the original finish did..."
The stock finish sounds like it might have been shellac , chosen because multiple coats can be sprayed on in a day. Any wood floor can be helped with a coating of Gym , or Bowling alley varnish,made to be less slippery when wet with water or beverages.